The late, great Alfred Hitchcock’s final film was 1976’s Family Plot. The movie was a tepid, disappointing lark that caused the “Master of Suspense” to go out with a whimper. Why couldn’t Frenzy have been Hitchcock’s swan song? I’m no authority on the films of Claude Chabrol, the legendary French director who died earlier this year, leaving Inspector Bellamy as his 50th and last feature, but I’m guessing that Chabrol’s legion of fans are also disappointed. Bellamy is an alleged “murder mystery” starring portly Gerard Depardieu as a police commissioner on holiday whose seaside reveries are rudely interrupted by two sources: a nervous stranger who seeks his counsel regarding an apparent murder, and the reappearance of Bellamy’s ne’er-do-well, annoying younger brother, a surly sort who carts old emotional wounds into guest quarters at Bellamy’s previously peaceful household. 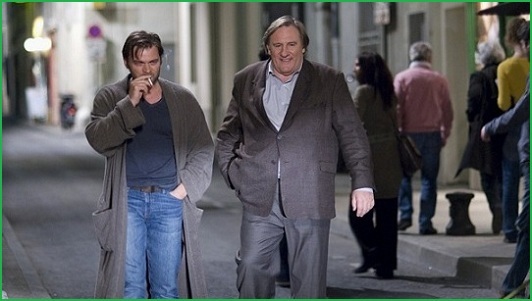 Depardieu is a genuine movie star, and it’s just as engaging to watch him eat breakfast with his wife (Marie Bunel, in a strong performance) as it is to see him investigate dark doings. But Inspector Bellamy is all breakfast and very few dark doings; it’s a character study with characters not much worth studying.